Aaaaaaaaaah, Raglan. A relaxed surf town on the North Island’s west coast with a vibe that constantly reminds you to chill. We arrived after dark on Friday and awoke to sunshine and beach views from our room. My first priority was to complete an 8-mile training run. I took the opportunity to run on the beach and explore further than I had on my first visit. With my long run out of the way we walked to my favourite restaurant, the Shack, to refuel with corn fritters and eggs. A hearty breakfast was required for the day ahead. 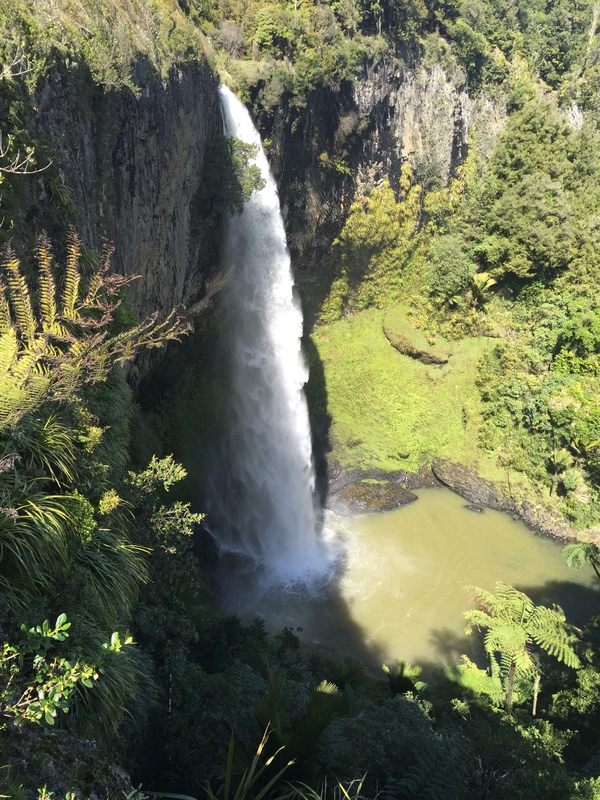 We drove 20k out of town to Bridal Veil Falls, or Wairēinga in the native language. A 10-minute walk through the bush is rewarded with views of the powerful 55-metre waterfall from all angles. A short drive from the falls is Mt Karioi. 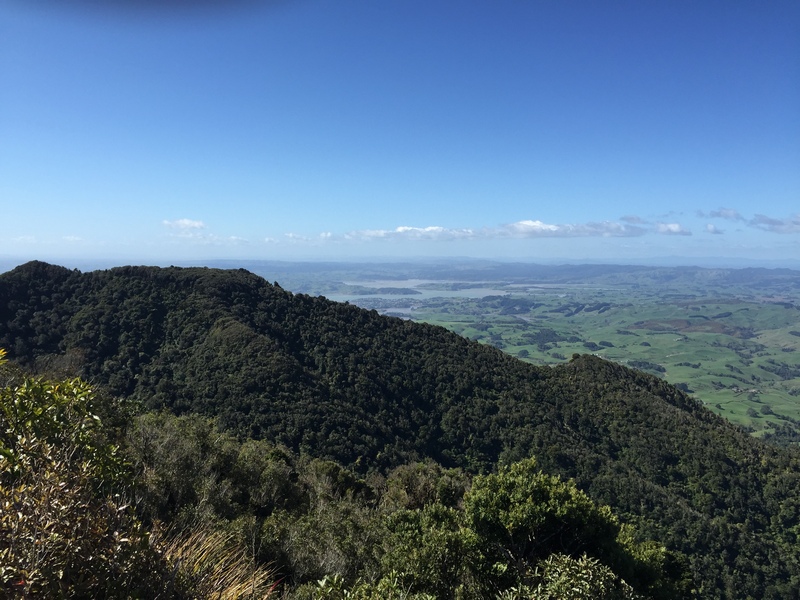 There are a couple trails to the summit; we chose the Wairake Track, an estimated 2-3 hours one way. Starting at 12:30 we had plenty of time before sunset. The first 40 minutes of the trek was through private farmland. The cattle were intimidating, but mostly scattered at our approach. Beyond that, the path grew steep and muddy. I was grateful I had the forethought to pack my hiking boots, otherwise my feet would have been cold and wet within 15 minutes. It was a challenging climb to the top. I wanted to turn back a few times to avoid the eventual pain and soreness in my legs, but we pushed on to the ladders and final ascent. 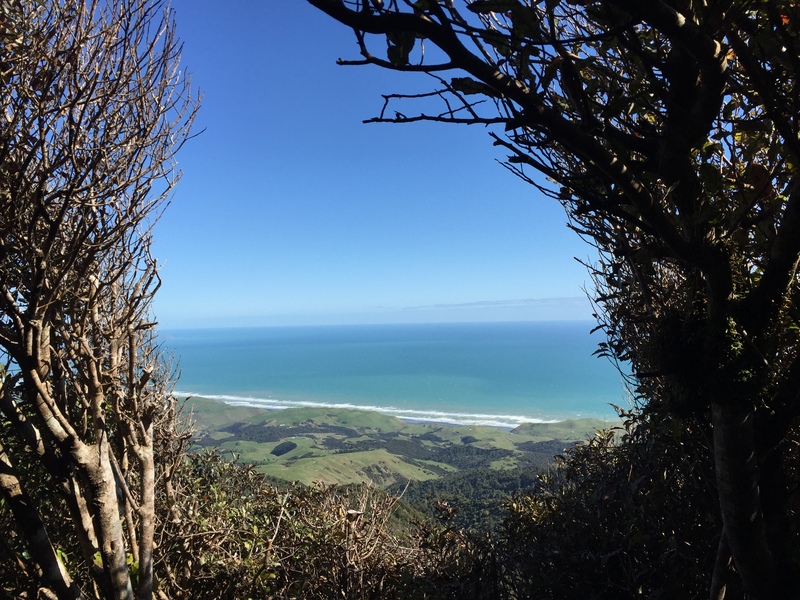 At the top, 756 metres above sea level, the wind was howling as we took in coastal views. The scramble down was taxing as we tried to keep balance and hop from roots to rocks on fatigued legs. We finally emerged back into the sunshine, amid the cows and sheep. Impressed with our bodies’ ability to handle a grueling day, we drove back to town to unwind among Raglan’s boutiques, watering holes, and friendly people. Accommodation: private room at Raglan Backpackers. We enjoyed the fireplace in the lounge.